1. This Current Affairs Quiz June 4 2017 is meant to be a check for your learning and is meant to serve as tool for assessment. 2. Current Affairs Quiz June 4 2017 is designed to check your Current Affairs General Knowledge and provide you an assessment of the same. 3. 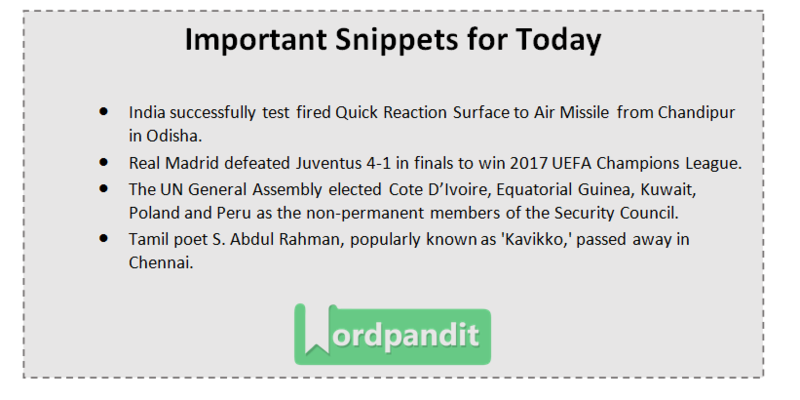 Each question in Current Affairs Quiz June 4 2017 followed by 4 options. Select the most appropriate option for the question. Question 1: Who has been named as the new CEO of Prasar Bharati? Shashi Shekhar Vempati has been named chief executive officer of Prasar Bharati. He will replace Rajeev Singh, who has been serving as interim CEO since February 2017. Question 2: UN General Assembly has elected how many non-Permanent UNSC Members? The UN General Assembly has elected 5 non-permanent members of UNSC. They are Cote D’Ivoire, Equatorial Guinea, Kuwait, Poland and Peru for a two-year term beginning January 1, 2018. Tamil poet S. Abdul Rahman, popularly known as ‘Kavikko,’ passed away in Chennai. He was ranked among the few who introduced modernism to Tamil poetry. He was also awarded Sahitya Akademi award in 1999. Question 4: Who among the following won 2017 UEFA Champions League title? Real Madrid defeated Juventus 4-1 in finals to win 2017 UEFA Champions League. Real Madrid became the first team to retain the UEFA Champions League. This is Madrid’s 12th Champions League title. Question 5: All states have agreed to rollout GST from ……….? All the states have agreed to roll out Goods and Services Tax from July 1. GST Council has cleared the pending rules, including transition provisions and returns. Question 6: India’s first freight village will be set up in which of the following cities? Varanasi will get the country’s first ‘freight village.’ The facility will come along Ganga’s –multi-mode terminal and will be spread across 100 acres. A freight village is a specialized industrial estate which accommodates companies that require logistics services and improve their competitiveness within the cluster. Question 7: Which Indian bureaucrat has been appointed as a public policy fellow to a top American think-tank? Former Indian Ambassador to US Nirupama Rao has been appointed as a public policy fellow to a Washington-based think-tank where she will work on a project on the Sino-India ties. Question 8: Who is the newly elected Chancellor of Jamia Millia Islamia (JMI)? Question 9: Love Raj Singh has become the first Indian to scale Mt. Everest 6 times. He hails from which state? Love Raj Singh Dharmashaktu, a Padma Shri recipient who hails from Uttarakhand, has conquered the Mount Everest for the sixth time on May,17,2017.Dharmashaktu, works with India’s border-guarding force — Border Security Force. Question 10: Dailong village, which has been declared as a biodiversity heritage site, is in which state? The Manipur government has declared Dailong village of Tamenglong district as a Biodiversity Heritage Site of the state. Dailong is a medium size village of the Tamenglong district, Manipur with total 234 families residing, with a population of 1634, out of which 819 are males while 815 are females as per Population Census 2011.